Roasting and blending the cauliflower makes the soup creamy and sweet. 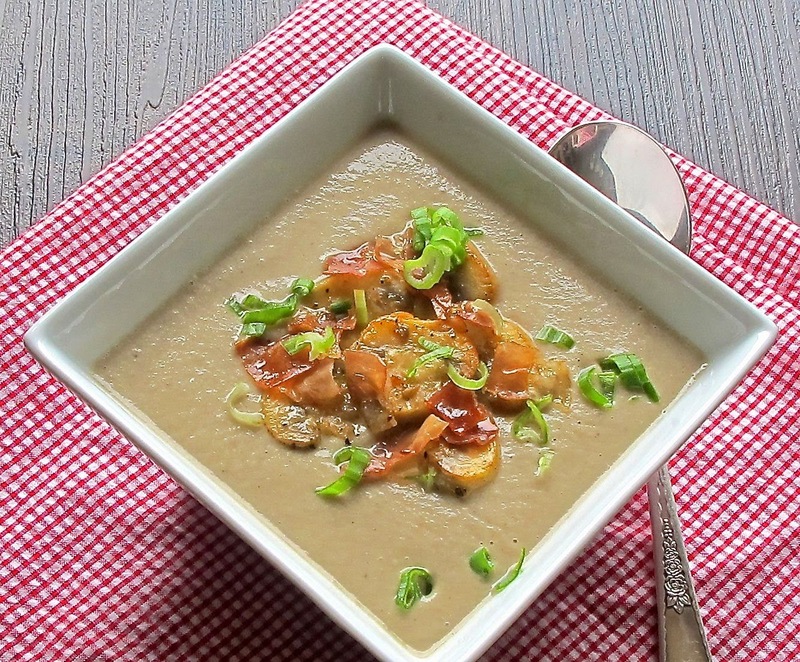 Sauteed mushrooms give the soup a hearty feeling and the crispy prosciutto gives it a smoky touch. Line a baking sheet with foil and toss together cauliflower, mushrooms, and onion with the olive oil. Sprinkle with salt and pepper. In a blender, combine stock, thyme and the roasted cauliflower, mushroom, onion mixture. Add sherry and salt and pepper. Blend well. (may need to be done in batches) Pour into large saucepan and heat through. While the soup is heating, combine the butter, mushrooms, and garlic in a small saute pan, over medium heat and saute until just browned. Remove from pan and set aside. In the same saute pan, add the prosciutto and cook until crisp. Pour the soup into serving bowls, top with a few small mushroom and crispy prosciutto. Sprinkle green onions over top, if desired.